Hey style surgeons! I know I talk a lot about fashion on this blog. But I thought we'd take a quick break and talk about one other thing I love: FOOD! Now, I'm not very big on cooking. I actually need a whole lot of practice. 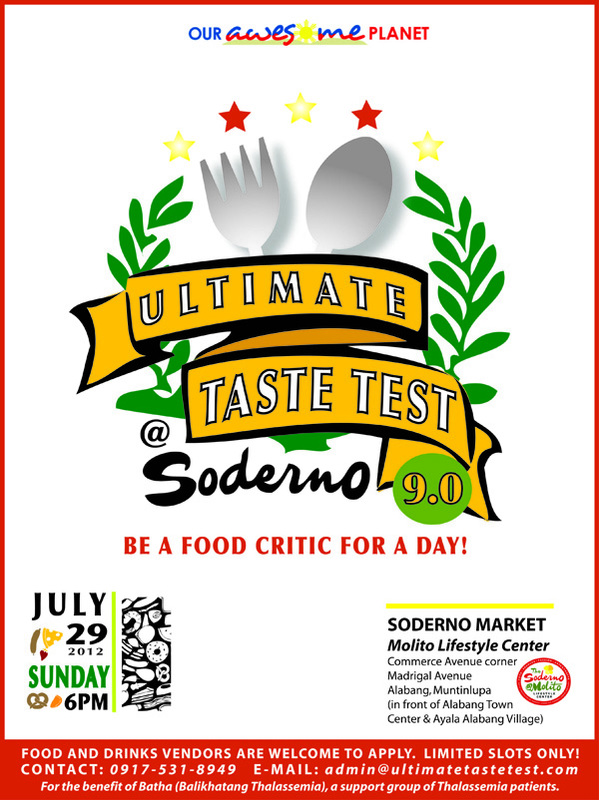 But for those who are good with the grill (or pan, or whatever), the Ultimate Taste Test 9.0 will be happening on July 29, 2012 at Soderno Night Food Market in Molito, Alabang. Continue reading to know how you can be a part of this. Take advantage, fellow south friends! This is open for those from the north too, of course. This event has been organized by Anton Diaz, the man behind the popular food and travel blog, Our Awesome Planet. The event is an opportunity to try out and personally critique different specialty food and new or soon-to-be-launched dishes straight from the kitchens of up and coming and popular food entrepreneurs from all over Metro Manila. If you are interested to enter your food and/or drink product/s in the Ultimate Taste Test 9.0, you may contact rache@diaz.com.ph or 0917 531 8949.